"Public speaking skill training and begin a motivational speaking career as a professional keynote speaker".
" 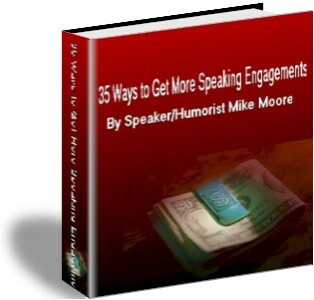 35 Ways to Get More Speaking Engagements"
Earn more speaking 4 times a month than most earn working full time for someone else. Just want to say thank you so much for taking the time to talk with me on the phone. You made me feel welcomed right away, it was like I`ve known you all my life. You were very informative in fact you over delivered on your great wisdom and insight about public speaking and I really appreciated that. I am looking forward to the future with much more confidence......again thank you. * In this special report I will share with you the exact process I use to get between 30 and 40 paying speaking engagements a year throughout Canada and the U.S.A.
* How to get paying gigs by offering to deliver free speeches. * I will show you how to maximize the power of word of mouth promotion. My name is Mike Moore and I earn my living speaking to audiences throughout Canada and the United States on "Humor and Stress Management", "Humor in the Workplace" and "Maximizing Staff Potential Using Humor and Recognition". * Each year I receive between 75 and 100 invitations to speak and I accept between 30 and 40 of them. * Public Speaking is what I do for a living. Let me help you do it too. You can be a terrific public speaker with all the goods but if no one asks you to speak it means nothing. a professional speaker who sits by the phone waiting for the world to come to you with an invitation to speak? ...like to have a regular flow of seriously interested potential clients inviting you to speak? ...like to learn how to be actively involved in motivating people to call you to speak? Like to get results without cold calling? In "35 Ways to Get More Speaking Engagements" I share with you all the GIG GETTING STRATEGIES I use in my public speaking career. There is no filler or fluff, just practical, effective strategies that, if applied, get you the gigs you want. * How to put the Law of Expectations to work in your public speaking career. * How to be a more entertaining speaker. * How to improve your speaker appeal. Some people sit on their buns and say, " What Happened?" Be a speaker who MAKES THINGS HAPPEN! If you are reluctant to buy and would like to talk to me about your concerns just call 519 753 0702 and I will be glad to help. You just can't beat this offer!! A new public speaking special report with tons of public speaking tips to help you get between 30 and 40 gigs a year. If you have a question or concern and want to talk to me about it you can reach me personally at 519 753 0702. This is not an answering service. I answer my own phone. Mike Moore is a professional speaker who delivers humorous, entertaining and informative keynote speeches and motivational seminars across Canada and the United States. He also is committed to helping aspiring speakers start an exciting, profitable public speaking career.
" Search Engine Ranking - servicewrap.net: motivational speaking career - public speaking career"